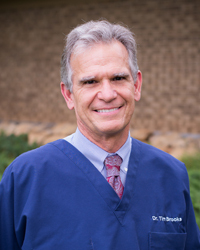 Dr. W. Timothy Brooks has over 30 years of experience providing family preventive, cosmetic, and restorative dentistry to the Huntsville, Madison, and Decatur, AL communities. In a friendly, family-oriented environment, Dr. Brooks and his team can give you ideal dental health and a beautiful smile that will last a lifetime. Our dental services include regular cleanings and checkups, pediatric and sedation dentistry, treatment for TMJ/TMD, sleep apnea treatment, and snoring prevention. We also provide a full suite of implant dental services, such as regular dental implants, mini implants, and implant supported dentures. Cosmetic dental treatments are a great way to improve how you feel about your teeth. From teeth whitening with Opalescence® to Invisalign® and Snap-On Smile™, you’ll feel confident to show off your smile. Our entire team is at your service to make your visit a pleasant surprise. Whether we can offer you a cup of delicious coffee or a memory foam pillow and blanket to keep you comfortable, we want your experience to make you smile! Contact our Huntsville dental office to schedule an appointment with Dr. Brooks today.